After leaving Famous Dave's BBQ my older daughter and I did some shopping in West Knoxville. Would you believe that her choice is usually Turkey Creek? Today was no exception. After hitting a few stores we decided to treat ourselves by heading for ice cream at Marble Slab Creamery on Parkside Drive. My birthday coupon for a free 'Big Dipper' definitely influenced our choice. I received the coupon by signing up on the website a few months ago. Why pay full price if you don't have to? Marble Slab Creamery sends updates and coupons right into your inbox. Our cost with the free ice cream birthday coupon deducted was $5.01 with tax. It would normally have been in the $10 range. Business seemed to be steady at the Marble Slab Creamery. One person was ahead of us in line. It took a the cashier a minute to check us out anyway when it was our turn. The staff members were nice but not outgoing. 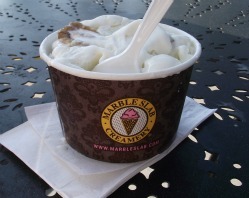 Service wasn't as great as our experience at the Marble Slab Creamery near the Bass Pro Shops in Kodak. It was ok though. We'll probably go back.